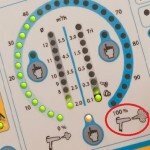 When you first start powder coating, adjusting your powder coating gun settings can be confusing. We’ll cover the most important terms and settings for everyday powder coating situations and addresses some common issues you may encounter. Once you understand how electrostatic powder guns work and know what the basic gun settings do, you can improve your powder coating results quickly and confidently. Author’s Note: All examples in this article use the Wagner EPG controller for illustrative purposes, but other brand-name professional quality guns have similar controls. “kV” is the symbol for kilovolt. One kilovolt = 1000 volts. It is a unit of measure indicating how much electrical charge an electrostatic powder gun can produce. Lower kV settings are best for Faraday cage areas and when working with some specialty powders, such as metallics. As a general rule, the more detailed and complex the part, the lower the kV setting. Professional quality powder guns from companies like Gema, Nordson and Wagner typically have a maximum voltage setting of 100 kV. A good starting point is a setting of 50 to 80 kV for applying a single coat (or the first coat) to an uncoated part. When working with Faraday cage areas, turn down the voltage. When applying a second coat, a lower kV setting can give the best results. What is the Faraday Cage effect? This describes what happens when you are trying to powder coat into a recessed area like the inside of a box. Highly charged powder particles are attracted to the closest grounded metal surface–the sides of the box–so they have a difficult time penetrating into the corner. This often happens with parts that have tight corners, angled features, prominent bends or recessed areas. Window and door trim, frames, boxes, wire racks, I-beam sections, angle iron, conical parts, u-shaped channels, uni-strut, grids, and other unusually shaped parts can be tough to coat without adjusting the gun’s output. By reducing the electrical charge (lowering the kV setting), you can help sprayed powder penetrate Faraday cage areas more effectively. It is important to have a good ground. This is the physical connection that allows an electrical current to follow a path to earth. A ground is needed for the charged powder particles to effectively be drawn to the metal part. The stronger the ground, the more effectively the electrostatic process works. We recommend the use of a dedicated grounding rod. Get a copper grounding rod of at least 8’ length from an electrical supply company. Drive the grounding rod into a spot as close to your powder spray booth as possible (yes, you will have to penetrate your concrete floor if you have one). Using a good quality grounding strap of 14 gauge or heavier wire (heavier is better) and a well-made clamp, connect the ground rod to the rack or hook that is supporting your part. This will dramatically improve the performance of your coating gun, especially when dealing with complex parts. In some areas, you may need to pour a few ounces of water into the hole around the grounding rod to improve the quality of your ground. Another way to improve results in Faraday cage areas is to aim the gun near the corner or detail area, but not directly at it. Wrap is the term that describes when sprayed powder is attracted to the back side of the part. Wrap means that the gun delivers powder to areas of the part that aren’t directly in front of the gun’s output. By having a good quality ground, you can get improved wrap on panel-shaped parts and improved penetration into Faraday cage areas. Remember, voltage and amperage are not the same thing, so it may be important to also adjust the amperage at which the powder is being sprayed. “µA” is the symbol for microampere. One microampere = 1/1,000,000th of an ampere. It is a measurement of electrical current. It indicates how much charge is moving from the gun’s electrode to the cloud of air and powder exiting the gun, and then onto the surface of the part being coated. This may be the hardest gun feature to understand. Voltage and current (measured in microamperes) have an inverse relationship when you’re talking about powder coating guns. Voltage is a measurement of electrical “potential to do work,” while current is a measurement of the actual movement of electricity–“the work being done.” When some of the potential energy is used, it becomes current. As current increased, there is less potential (unused energy) left. 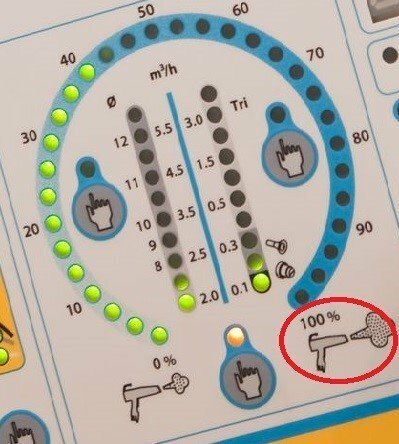 A gun’s current feedback system can indicate to the operator what the electrostatic charge is doing. It is, in some ways, more useful than just looking at the kV setting. This is because the microamperage reading tells you how much of the charge is working, instead of just indicating the charge’s maximum potential like the kV setting does. On powder guns like the one shown from Wagner, you can see the effectiveness of the charge and limit how much current is possible. This allows you to understand and control how much energy is being used. The kV setting is, in part, restricted by the power supply. While spraying a part, the load on the power supply limits the actual output, so the voltage may be lower than the setting. The current load increases as the gun gets closer to the part being sprayed. 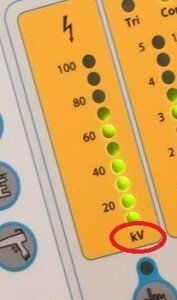 On a gun with an adjustable current limiter, when the current load reaches the set limit, the kV will quickly decrease. This helps prevent problems from too much voltage (like dimples in the coating from back-ionization), especially when the gun is too close to the part. Also, if the amperage is not limited to a certain range, the transfer efficiency may suffer in Faraday cage areas or the powder may not coat evenly if the gun-to-part distance is inconsistent. Setting the µA range to 20-25 can help with difficult to coat areas. Wagner powder application guns automatically balance the powder output with the airflow via the main dial. The number selected is the actual maximum percentage of powder that can be used. Typically, 70% is the highest you would want to go. When working with intricate parts, this number can be much lower. These are settings pre-determined by the gun manufacturer or the operator. They are intended for the most common scenarios encountered by typical gun users. Flat Panel Setting: This setting provides maximum kVs and a high volume of powder being sprayed. This is for large flat panels and will provide a lot of powder wrap. Repaint Setting: This setting is for a previously painted part that needs more powder for cosmetic or performance reasons. The kVs are reduced, as is the powder volume, since there is already powder on the part. Faraday Cage Setting: This setting lowers the kVs, restricts current µAs, and reduces the powder flow percentage to allow powder to penetrate difficult-to-reach corners and angles. My Powder Coating Gun Is Set, Now What? Once you’ve got your powder gun adjusted correctly, you are ready to start spraying powder. Before you begin coating a part, look at the part and figure out how you will get the best and most efficient coverage while spraying. As your part becomes coated with powder, a charge will build up on the surface. It will make the Faraday areas even more challenging to coat. Therefore, it is best to coat the Faraday areas first, then spray the flat surfaces of the part. After rehearsing what you are going to do, you need to get the powder flowing smoothly through your gun. Spray the powder coating gun away from the part until a uniform cloud is coming out with no sputtering or surging. This may take up to a second or two. Move the gun to the part and move it in a slow, controlled motion across the part, keeping a gun-to-part distance of around 8”. Keep the gun triggered and spraying until the part is done—don’t start and stop. If possible, try to get full coverage with a single pass across the entire part. Often you will need to move the gun in a controlled back-and-forth motion, starting with side-to-side movements and then switching to up-and-down passes if needed. Inspect the coated part with a bright light to help detect thin spots. Touch up any spots you see before curing the part, but be careful not to add too much powder or to let the gun puff powder onto the touch-up areas. These common mistakes happen when you become impatient and blast the part with a heavy fog of powder or don’t let the gun’s powder flow stabilize before attempting touch-up work. Air Supply Problems are not uncommon. It is critical that you use only cool, dry, oil-free compressed air to power your powder application guns. Make sure you have an accurate in-line pressure gauge and a regulator that can restrict the amount of pressure reaching your gun. You may need to use a powered air dryer, and you will definitely need a filter system that traps moisture and oil. Fluidization is what we call the small amount of air movement that aerates and fluffs the powder around the pick-up tube on a box-feed unit. An adjustable valve controls how much air is provided. The air helps break up clumps of powder before they are pulled into the pick-up tube and pumped through the gun. It is also the term used for the air movement that mixes the powder in a hopper container. In the hopper unit, there is a plastic membrane at the bottom with lots of tiny holes that allow the air to condition the powder. When adjusted correctly, it will look like the powder is slowly boiling. Impact Fusion describes what happens when partially gelled powder sticks to sharp areas in the gun and inside the powder pump. This problem is more prominent in hot shop environments and when working with poorly conditioned powder. The stuck-on powder can be removed with a clean, fresh shop towel and denatured alcohol. Mil Thickness is the term used when talking about the thickness of the powder coating material that has been cured over the surface of a part. One mil = 1/1,000th of an inch. A healthy human hair is about one mil thick. Most powder coated finishes are between 2 and 4 mils thick, with some finishes up to 6 mils or thicker. Achieving ideal powder thickness and uniform coverage takes practice. Make sure to keep good notes. Some coating instructors have their students spray test parts to learn about adequate powder coverage. A student sprays a part while the instructor illuminates the surface of the part with a bright pocket flashlight. Once the flashlight no longer reveals any bare metal spots, the student stops spraying. This method typically results in a finished coating that is about 2 mils thick. Orange Peel describes the uneven, “wrinkled” finish that can happen after curing if the painter sprays too much powder on the part in some places. You can end up with areas of heavily concentrated powder that flow out into wavy sections that have something of an orange peel texture. The excessively thick powder in these areas will also make the finish more prone to chipping. If the applied powder is under-cured, especially as the result of the oven temperature being too low, the powder can also fail to flow out properly, even if it’s not too thick, causing the same type of textured defect in the finish. Powder “Starved” Finish/Light Powder are terms used to describe the grainy texture that a defective finish can have after it is cured if the part does not get adequate powder coverage. If there wasn’t enough powder on the part for it to flow together and create a uniform coating, it can have an odd, textured appearance. Even worse, the part will likely start to rust or oxidize in these textured areas because the part’s surface isn’t fully covered by the coating material. Using a powerful flashlight or LED inspection tool can help prevent this by allowing the painter to see areas that need more powder. A professional powder coating gun can make a huge positive impact on your operation, allowing you to coat with more accuracy, better efficiency and higher quality. Reliant Finishing Systems only offers professional powder guns from companies like Wagner. Need a new powder application gun or a complete powder coating system? Our powder coating specialists are ready to help – give us a call today! This entry was posted in News on June 29, 2016 by Bruce Chirrey.